I did it. 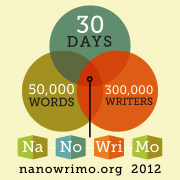 I went and signed up for NaNoWriMo and now I'm having buyer's remorse. I've never signed up for this before even though I've known about it for years, but I know me, I'll never write 50k in a month. I don't have the time to devote to this. Are they insane? Am I insane? Well, yes, the obvious answer is yes. Well, whatever, I'm committed now. Besides, I've had a story in my head for years that I can't ever get out. I've rewritten the first chapter in so many variations and then tossed it, it's ridiculous. This is it's final chance. Write it or Kill it. I should probably sound more enthusiastic, right? Just write as much as you can--no revisions as you go. Just spew those words on the page. You can do it!!! Yay! It's so much fun--glad you signed up. What's your username? Mine is Lara Lacombe (big surprise, right?) See you there! Thanks guys. I'm really kinda nervous about it. I just signed up with my name too. Clover Autrey. Have you done this before, Lara? Do you friend each other? I saw writing buddies, but had no idea what that meant. Join the club. I am doing NaNo for the third time. This time I plan to go all the way. Hey Pat, how's it going so far? I'm already way behind... Trying to catch up today.